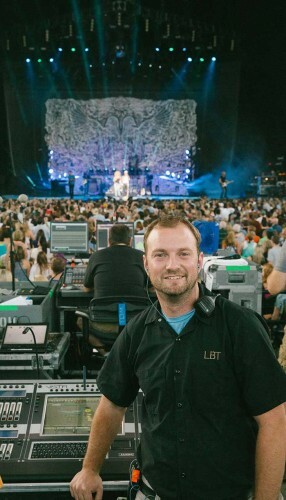 A Jands Vista T2 console was chosen by US based lighting designer, Chris Shrom, to control lighting for the Grammy Award-winning vocal harmony group Little Big Town, currently touring North America until mid-December. Chris was challenged with programming a rig which would have as much impact outside in daylight as it does when the band moves inside arenas. Chris worked closely with the band, tour project manager, Chris Diener and show designer, Raj Kapoor in designing something that worked well in all scenarios - choosing a dynamic rig featuring Sharpys, Atomic 3000s with color scrollers, Nocturn UV lights with Eclipse Shutters and Mac Auras. “I know the Jands Vista T2 well and I can program it very quickly. I've been using the Vista software now for almost five years. I love the timeline feature: Its simple, easy to look at and work in. The less thinking I have to do when building cues with complicated timing, the better. I can compact two or three steps into one by arranging various attributes to happen chronologically. Click, Drag, Done … moving on. Chris reveals that during the tour, all flown items are provided locally, requiring regular fixture swaps. Despite using the Vista for many years, Chris continues to be surprised in new ways by its flexibility and ability to make light work of creative challenges. At one festival recently, which was held on a Saturday, it meant that Chris’s access to helpful advice from a lighting manufacturer was limited. “I had a bunch of LED lights that were brand new,” explained Chris. Bandit Lites, based in Knoxville, TN, USA, provided all the lighting equipment for the tour.